I think I may have been a squirrel in a previous life as I like nothing better than having lots of homemade food stored in the cupboards and freezer. Stocks of one of the staples of our diet had begun to get rather low - homemade pesto, but thankfully the foraging season has begun and so has the pesto making. 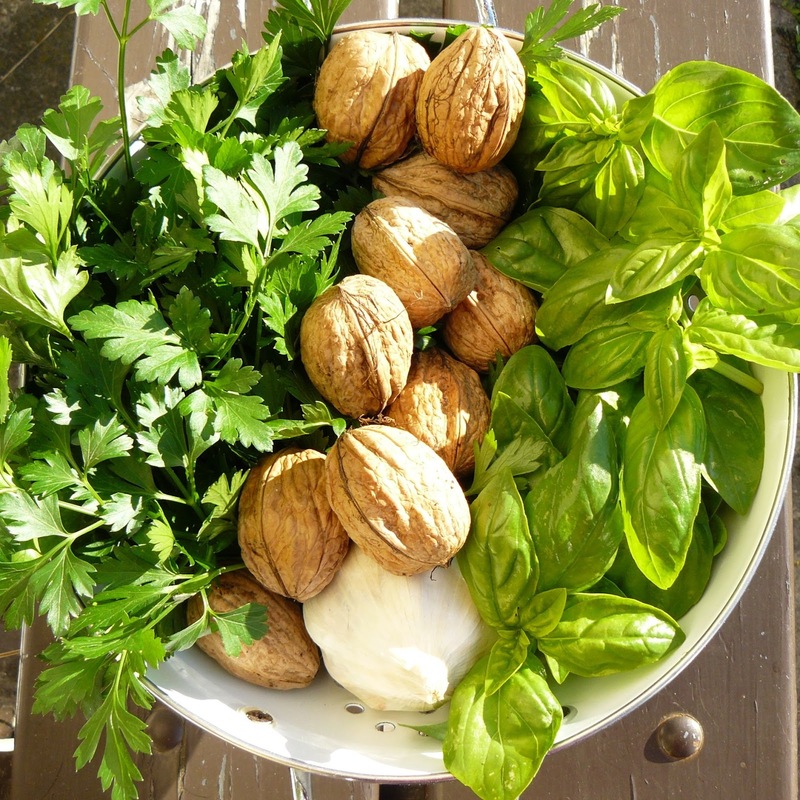 Pesto is a regular favourite for us, made twice a year and stored in the freezer in handy ice-cube sized portions. 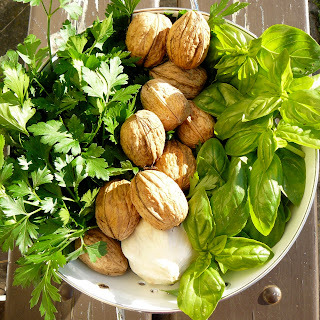 The first batch, that I have started making this week, is made using the foraged wild garlic leaves and our own walnuts, and then later in the year I make it with our fresh basil, parsley or rocket leaves, walnuts and this years real garlic harvest. I also make a hot pesto by adding a couple of fresh chillis (with seeds) to the mix. I am not too good on exact quantities, but here is my approximate recipe. 2 or 3 generous handfuls of shelled walnuts (or more traditionally pinenuts). 5 or 6 cloves of peeled and crushed garlic. A very generous bunch of washed basil (or rocket/parsley/wild garlic leaves). If using wild garlic, omit the garlic cloves. A couple of chillies (optional). Enough olive oil to mix to desired consistency (wet, but not too wet). See what I mean about an approximate recipe - I really am a bung it all in kind of girl! 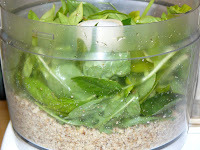 Put the walnuts into the food processor and chop, then add some of the leaves and blend, then add the rest of the leaves (I usually fill the bowl with leaves each time) and the garlic. Once the leaves are mushed add the olive oil through the pourer whilst blending, until the consistency is right. If using fresh you can add some grated parmesan, but as I tend to freeze mine I don’t. Spoon into ice cube trays and then once frozen store in a freezer bag until required. Once defrosted we add natural yoghurt and parmesan to make a delicious creamy pesto that is used; as a dip for aperos, as a topping for salmon fillets, to make a really healthy tuna mayo (without mayo), as a simple pasta sauce, to add a herby/garlicky punch to soups and casseroles, in fact the list is endless. I just love the fact that nearly all the ingredients are from the garden, it is easy to make, stores really well and can be used all year in so many different ways. If you grow any of these ingredients, or can get picking wild garlic, I hope you give this a go.